I had foot surgery at the beginning of June, so it’s been a pretty uneventful summer since. What better way to spend my time than immersing myself in preschool Pinterest projects? I’ve been wanting to make sensory bottles for quite some time. Now, I’m not sure if I can stop. These things are addictive. Even more so since I made them in my three favorite colors: rainbow, glitter, and glow-in-the-dark. I will give you the step-by-step to make each bottle, listing the materials, tips, and pros/cons. To remove the logo from the glass bottle, gently scrub it with a steel wool pad (found near the sponges). Shout out to my boyfriend for consuming 2.5 liters of sparkling water tonight! 3. Add glitter. Lots of glitter. 4. Squeeze a few drops of food coloring into the water. Watching items suspended in water makes me nostalgic of the semester my college roommate and I kept sea monkeys in a mayonnaise jar. Pros: Very mesmerizing qualities. You can never have too much glitter. Cons: I found it a bit challenging to get the water:glue ratio just right. 1.) Sort your beads by color and put them into bowls (I made the mistake of waiting until they grew to marble-sized, slippery orbs before I sorted them. Needless to say, that decision quickly made it to the cons list). Pros: This bottle is absolutely beautiful! It is also super fun to plop the beads through the funnel. This would be a fun bottle to make with kids. Cons: Sorting them by color can be tedious. Also, I made my layers too big at first and could hardly fit all six colors in the bottle. Instead, I dumped them out and made my layers about an inch big and just repeated the pattern. Craft fail or craft win? Who’s to say. To put it vaguely, this bottle was very trial and error. Author’s note: If I were to remake this bottle I would use clear hair gel instead of water/glue solution, nix the food dye, and then add my glow-in-the-dark items. Pros: I love that this glows in the dark! Cons: The water/glue solution was not very thick, and the beads and stars floated to the top immediately. And there you have it! 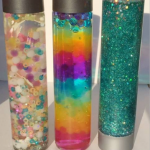 3 easy, fun sensory bottles! Are you on Instagram? Tag @especiallyeducation in your sensory bottle pictures! Where did you get the jelly beads? These are So fun and clever! 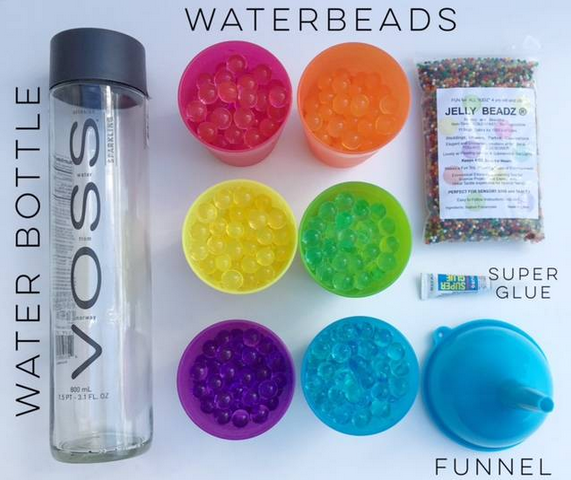 I purchased the water beads from Amazon (you should be able to click on the link from the blog post). They are ridiculously cheap and the kids love playing with them! Thanks for checking out the blog! 🙂 See you soon! You can buy them for really cheap on Wish.com. I bought mine from Wish.com also! As of 2018 I found them in craft section of Walmart for like $3.00, but Dollar tree has clear ones too, if not colored, if you wish to use colored water. Love this! I’ll share my patriotic one when done! Hi, for the glow bottle, do you mean by using just clear hair gel and food dye? Will that be too thick? 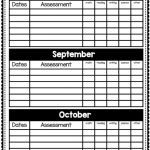 I can’t wait to read all about your great resources!! 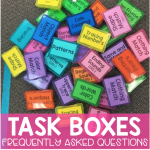 Thank you for adding me to your email list so I can look at all of the great resources and ideas you have to share. If you use clear corn syrup it works much better. About a little more than 1/4 of corn syrup put your stuff in the rest of the way to the top water. On the rainbow bottle, if you shake it does all the beads get jumbled? 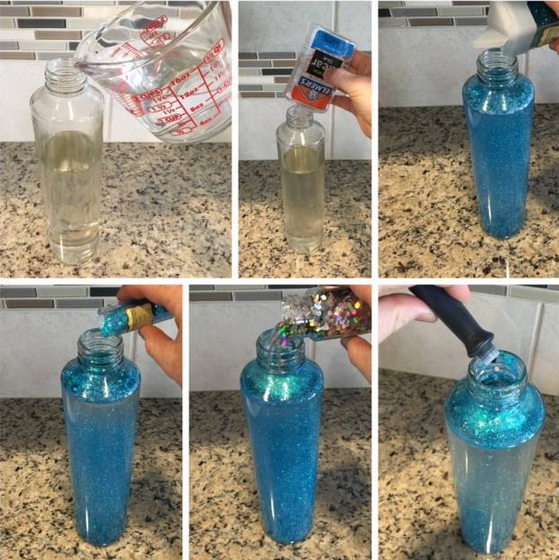 Some sensory bottles you shake and watch the glitter, but is there much you can actually do with the rainbow bottle? It’s very pretty and cool looking, just wondering if you can do anything else with it? Awesome i have a question we need to use the elmers glue, what is that its alike normal glue? I am so doing these with my niece! Quick question…how long do these last? Does the glow-in-the-dark stop glowing so much at some point? Does the glue in the bottle “harden up” over time? Just trying to understand if these will last a while for her to play with…thanks! Glow beads and other glow products usually glow again when exposed to light for a short time. Storing your art near a window or other light source during the day will ensure a glow-show in darkness! This is a great tip! Keep those glowing beads glowing. <3 Thank you, Joyce. How much clear Elmers did you use in the first bottle? When I have made mine I use a 16-20 oz. bottle and about 8 oz of clear glue. I use mine as a timer too so for that mixture the glitter will settle to the bottom in about 5 minutes. That’s a great tip! Thanks Shelley! I have mentally labored over trying to figure out how to make any of these for a few weeks. Yes, no kidding! I guess I’m craft challenged. I wish I knew someone or that there was a class I could take. So cute! You said you would use clear hair gel on your next glow-in-the-dark bottle. Would you recommend that for all of them? Or just the glow one? I have used baby oil because it is clear and clear hand soap. However the soap removed the colour off the red hearts glitter. The next time I used marbles. Now that is so relaxing to watch the marbles fall slowly. did you still add water as well? I cant get Elmers glue is South Australia any other suggestions? That is so awesome and fantastic for mindfulness and relaxation. Off to the shops to get the resources. Look sharp store is has all the items I need. Love this comment, Kayla! Mindfulness and relaxation are important for all ages. Are these bottles pretty durable for kids to be using? Im just a little worried about handing my kiddos a glass bottle. You definitely want to make sure the kids are on a carpeted area, and not tile. Thicker glass bottles are safer than thin jars. Hi I use recycled pop bottles or bubble bath bottles which are plastic. Great idea! Thank you, Susan. I plan on making these with my residents at an assisted living facility. Can’t seem to find a solid opinion of what the best medium is to use; clear Elmer’s Glue, baby oil, hair gel, hand soap, etc. I want a pretty viscous solution so the objects float fairly slow (remember the old Prell commercials with the pearl floating in the shampoo?). Anyone have suggestions and if you do, what ratio do you use? I have 16 oz bottles. Hello I made my 2 sons sensory bottles with baby oil and water then added loom bands, buttons and glitter some reason everything is clumping together any suggestions on what to do ( they items mostly stay at the top)? Hi Katie, I don’t have any tips, but join us on our Made For Me Literacy Facebook Group, and maybe someone there could help. It’s a super friendly group full of lots of good tips!